"It has been almost 10 years, and as the consciousness on the planet has evolved, so has the receptivity to Het-Heru's Chamber of gifts. Yet with the increasing anxiety that is building daily in our society, I was prompted to mix the new IMANI blend. There was an experience I had recently that reminded me of the importance of hope," reveals Het-Heru Maatkeru. 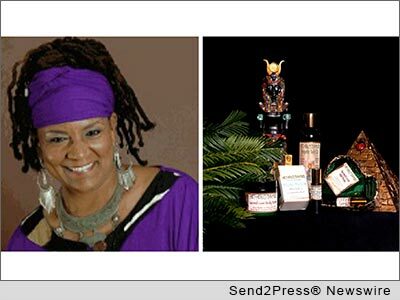 LEANDER, Texas, Oct. 28, 2013 (SEND2PRESS NEWSWIRE) — The “Goddess of Aromatherapy” and master Khamitic Yoga teacher, Het-Heru Maatkeru, has been guiding her patrons to deep dimensions of inner sanctity via the olfactory nerve for almost a decade now. Mixing mysticism and spirituality with an acute knowledge of aromatherapy her Het-Heru Chamber line holds a sacred space in the realm of scentilizing offerings that include essential oils, candles and body and hair products. With the introduction of her new divine blend, IMANI, designed to connect the wearer with their courageous self, Het-Heru has produced another exquisitely immersive experience of perfumed peace and equanimity. An expert in the early Egyptian sciences of sensory alchemy, Het-Heru has embodied her creations as sensations to stimulate dimensions that transcend the physical aspect of existence. The Nefer Atum collection is an invasion of aromas that harken ancient memories of temples, palaces and pyramids. The oils of musk, geranium, bergamot, majmua and myrrh are just a sampling of the ingredients used to sweeten her distinctive formulas. Blended as pure concentrates with no additional additives, only a few drops are needed. By anointing the wrists, inner elbows and neck pulse points, one is blessed for the entire day, while the affirmations provided with each vial serve to sear the spirit with positivity and gentle resolve. In addition to the Nefer Atum Sacred Oil ensemble, the Het-Heru Chamber includes the Nefer Atum Sacred soaps and Sacred soy candles; the “28 Day Chakra Balancing Program”; and the Sacred Love, the Gye’ Nyame and the Prosperity beauty products which all include body oils and body butters. As a true “Goddess of Aromatherapy,” Het-Heru continues to lead us by the nose weaving a magical web of sensual sensations. Enter the inner sanctum of the Het-Heru Chamber at http://www.Het-Heru.com/ and emerge smelling like roses from a world beyond. * PHOTO CAPTION Het-Heru, the Goddess of Aromatherapy, the IMANI Oil and Het-Heru Chamber product line.